NEW!---This cleaning kit contains 6 precision fit brushes. The brushes clean the Upper Receiver, Chamber, Bolt Carrier, .223 bore(AR-15),or .30 bore(AR.308), Bolt Carrier Key Tube, and the Gas Tube. 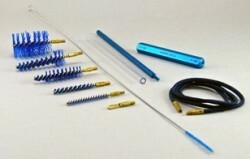 The Gas tube brush cleans the entire length of the gas tube without disassembly of the upper receiver. The kit also includes the Eliminator Cleaning Tool & Rod. This cleaning tool is handy for tight cleaning jobs where a regular rod is too long and cumbersome to use. This short sturdy tool is useful with any Eliminator Brush to clean pistol bores, chambers, revolver cylinders, case cleaning, neck turning, etc. Use it with the Bolt Carrier Key Brush, Bolt Carrier Brush and as a handle to attach the Eliminator Bore Cleaning Rope (also included).When the extension rod is attached, it is stationary and will not spin. Use it with the Upper Receiver Brush and Chamber Brush. It may also be used for any job that requires a longer handle.